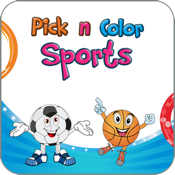 Pick n Color Sports is the first and only app on the market to include games along with coloring. It is the best way for young kids to learn about different Sports traditions! Choose the free hand option, where you can beautify the coloring with features such as spray paint, add an embossed effect and use a paint brush that gives you the effect that you are actually painting. We also have a clipart feature, where you can clip objects to your coloring such as chocolates, party decorations, balloons, flowers and toys! Greater depth and detail to the images that make it easier to color. If you are a fan of Draw Something, you will love Pick n Color Sports! We read every review and email and will try our best to update the app with your suggestions. Please take a minute and kindly rate your experience with the app. We would love to hear your questions and comments.